There is a new presence and an impression of breadth to the V-Class, thanks to newly designed bumper with striking cooling air intake and diamond structure of the radiator grille. The AMG Line features a new diamond radiator grille with chrome pins which both make for a still more sporty appearance. There are two new paint colours as well as four new light-alloy wheel designs that will also be available and a new-look interior thanks to newly designed air vents in a sporty turbine look and the new "tartufo" leather colour. The four-cylinder OM 654 diesel with reduced emission and consumption values and further improved noise and vibration characteristics is being used for the first time in the V-Class. The new top engine in the V 300 d with 176 kW (239 hp) and 500 Nm torque delivers the best values in the MPV segment (combined fuel consumption 6.3-5.9 l/100 km – 44.9mpg-47.9mpg, combined CO2 emissions 165-154 g/km). 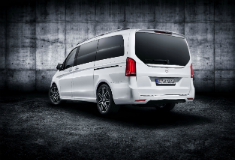 The multifaceted range of safety and assistance systems will become more comprehensive with the facelift. Available for the first time, the Active Brake Assist can, depending on the situation, reduce the severity of a collision with a vehicle in front, stationary obstacles and pedestrians crossing the vehicle's path (in urban traffic) or it can even prevent them from occurring altogether. And, the new Highbeam Assist Plus makes it possible to drive with the main-beam headlamps permanently active and only switches to dipped-beam mode when required. Sell your car with Money4yourMotors.